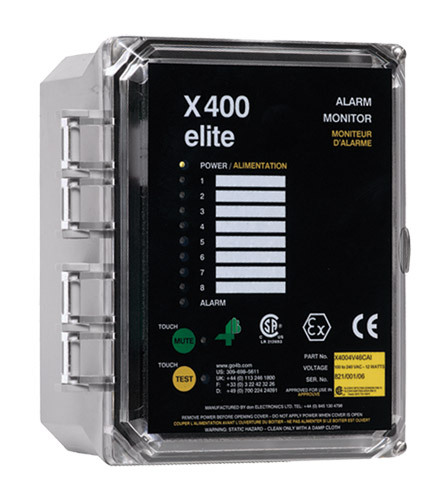 The X400 Elite is a microprocessor controlled low cost alarm indicator panel for use with level indicators, hazard controls and limit switch sensors. The X400 accepts signals from different sources in up to 8 zones, and is able to cause alarm and shutdown of the machine when an alarm condition has been detected. Alarm and status LEDs on the lid of the X400 provide quick location of alarm conditions. Alarm muting can be performed at the panel or by an optional remote push button to silence external alarms. If the system is muted, it will automatically reactivate when a new alarm is triggered. Testing can also be activated at the panel, providing full system verification. The Auto-Set series RF capacitance point level monitors are used for detecting high, intermediate, or low levels of liquids, powders and free flowing granular solids stored in tanks, bins, silos or other containers. The Auto-Set flush probe is a low profile RF capacitance plug switch level monitor designed for tight fitting applications to detect levels of liquids, powders and free flowing granular solids in conveyors, bucket elevators and surge hoppers. The RLI “SHAKER” rotary paddle switch is used to detect high and low levels of bulk granular solids in bins, tanks and silos. It can also be used to detect plug conditions in spouts, where long life and fail-safe detection is required. The RLI rotary paddle switch is designed to detect high and low levels of bulk granular solids in bins, tanks, silos, and as blockage detectors in spouts. The detection of material is achieved by a rotating paddle. If material impedes the rotation of the paddle, the motor topples of its axis and triggers a contact. The power supply to the motor is cut and the contact signals that a critical level has been reached, which will cause the motor for any inlet or outlet to close down or start up. The M1003 Stopswitch is a simple inductive shaft speed monitoring device. The self-contained unit, which signals when the shaft has stopped rotating. It can be used for process control, motion detection and stopped shaft indication. An inductive sensing device located in the nose of the M100 enclosure will detect a metal target. This target can be an existing bolt head or device attached to a shaft. The M1003 Stopswitch requires no calibration and provides an output when the shaft has stopped rotating. The M300 Slipswitch is an easy-to-use inductive proximity shaft speed monitoring device with an adjustable 0 - 30 second start-up delay, all housed in a 30 mm diameter moulded body. The self-contained unit has a single set point, which signals when the shaft speed has dropped by 20% of normal running speed. It is used for detecting dangerous slow down and underspeed conditions on conveyors, bucket elevators, air locks, mixers, fans, grinders and many other machines.